Most of the archeological sites in the Flagstaff area are in the pinyon-juniper woodland where crops like corn can be grown, and there are resources that can sustain small populations. The people were farmers, growing corn, beans, and squash. The pottery was Bluff black on red, related to the pottery of Bluff, UT, and dates to 1000 AD. Evidence of these early peoples and the way they lived is maintained by the National Park Service at Walnut Canyon National Monument. 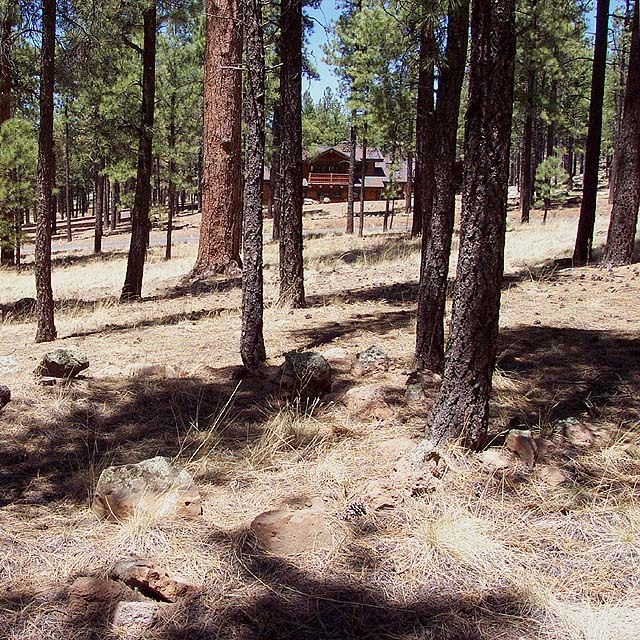 In Flagstaff in the ponderosa forest are remains of alcove houses, so named for the small alcove of the house which appeared to be a specialized work area. Such sites are shallow, so it was likely that the house was a surface structure over which poles were raised to form a roof that was covered with mud. The rocks were probably used to anchor the poles. These alcove houses are located at the top end of the elevational distribution of the Sinagua Culture. There are various sites between the Rio de Flag on the west and Schultz Creek on the east, with a 2 ft high rock structure, which appear to have been ephemeral. These locations would have provided access to water while taking advantage of the warmth of the sun. The first set seems to be from an occupation at AD 450, and a second more dense occupation from AD 850. When Sunset Crater erupted, indicated by tree rings at 1064-1065, small black sandy particles were spread over a 800 km2 area. Subsequently, the pit houses were abandoned. An alternative hypothesis of the eruption is that it lasted 100-200 years. After Sunset Crater, larger populations inhabited the area. Structures inferred to be ball courts were found at Winona from 1150. 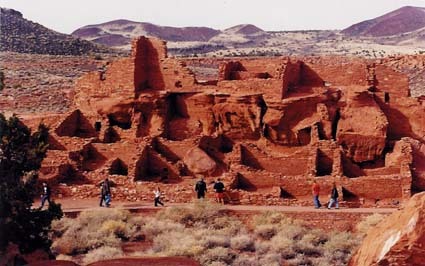 At Wupatki there are 100 rooms in the largest settlement in Northern Arizona. Perhaps Wupatki was a gateway from 1150-1250 between the Hohokam and other Native peoples. After 1375 sites had 500-1000+ rooms by the 1400's, e.g., on Antelope Mesa. The Sinagua are considered to be ancestors of the present-day pueblo people of Northern Arizona. The Hopi live on the mesas approximately 100 mi northeast of Flagstaff. Mangum, Richard and Sherry. 1993. Flagstaff Album. Flagstaff's First 50 Years in Photographs 1876-1926. Hexagon Press, Flagstaff, AZ.